A witness testified Wednesday that he felt like he was watching a movie stunt when he saw a pickup truck driven by an allegedly intoxicated Navy man fly over a guardrail on a transition ramp to the San Diego- Coronado Bay Bridge and onto a kiosk below in Chicano Park, killing four people and injuring eight others. Carlos Ulloa took the witness stand as a preliminary hearing got underway for 25-year-old Richard Sepolio, who is charged with gross vehicular manslaughter while intoxicated and DUI and faces nearly 24 years in prison if convicted. 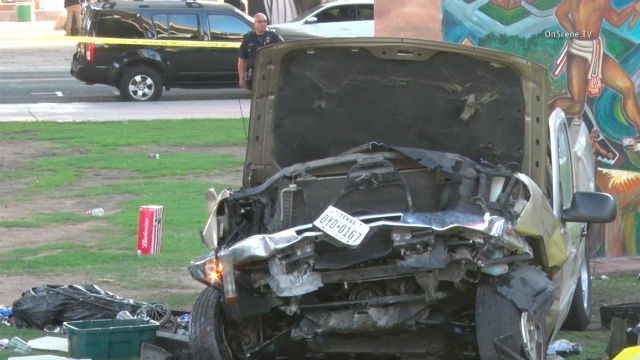 Annamarie Contreras, 50, and Cruz Contreras, 52, a married couple from Chandler, Arizona, and Hacienda Heights residents Andre Banks, 49, and Francine Jimenez, 46, were killed in the accident last Oct. 15. Ulloa, who lives near Chicano Park, said he was checking out an event at the park about 3:30 p.m. when he heard screeching tires and saw the defendant’s truck flying over the guardrail. Ulloa estimated 300 to 500 people were in the park at the time. He said he ran over to the smashed pickup — which landed on its wheels – – and just shook his head at the man in the driver’s seat. Ulloa said the defendant looked disoriented and his eyes looked red. A friend and Navy colleague of Sepolio’s, Stephanie Ruiz, said she took the defendant to brunch earlier that day because he had done her a favor. Ruiz said Sepolio had one beer and a glass of wine at a restaurant, then the two had an Uber driver take them back to her home. She said the defendant stayed at her place for about an hour, then drove off. Ruiz told defense attorney Paul Pfingst that Sepolio didn’t appear to be intoxicated when he left her house. California Highway Patrol Officer Juan Jimenez, who arrested Sepolio at a hospital, testified that he smelled an odor of alcohol coming from the defendant’s breath and observed that Sepolio had red, watery eyes. Jimenez said Sepolio blew into a preliminary alcohol screening device twice with readings of .059 percent and .060 percent blood-alcohol content and later had his blood drawn. The defendant’s blood-alcohol level was estimated to be between .08 and .09 percent at the time of the crash, according to prosecutors. Pfingst maintains that Sepolio had an insufficient number of drinks to be under the influence. According to Sepolio, another driver wouldn’t let him move over, so he gunned his engine and was going 81 mph in a 45 mph zone when he hit the left guardrail and spun off the freeway and landed in the park. At the conclusion of the preliminary hearing, which resumes Thursday, Judge Kathleen Lewis will determine whether enough evidence was presented for Sepolio to stand trial.